Jeff Bezos, the CEO of Amazon, is a famously principled leader. Ask any Amazon employee and you'll hear plenty of anecdotes about rules and principles. The "two pizza" rule, the infamous pre-written product release briefs and a cheap door for a desk (a sign of frugality) are just a few of many examples. 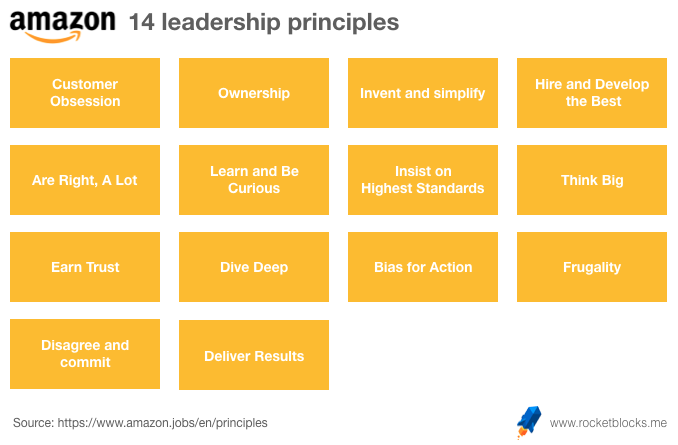 Thus, it should come as no surprise that when it comes to hiring product managers, the future leaders of the company, that Amazon interviews focus heavily on assessing candidates against Amazon's 14 Leadership Principles. In this post, we sit down with Abhi Tiwari, a Product Manager Leader in the Fulfillment by Amazon group, to discuss how product manager interviews at Amazon are structured and what key traits interviewers want to see from PM candidates. After an initial phone screen, PM candidates will move onto a final round of interviews. Here, candidates will typically go through five interviews and each interview will focus on a different topic. Hiring managers will coordinate in advance to ensure each interviewer has a specific topic to dig into that won't significantly overlap with over interviewers. Each interviewer will be focused on assessing the candidate's fit with their aforementioned Leadership Principles. While every leadership principle might not be explicitly tested over the course of the interviewers, you'll likely be thoroughly tested on a large chunk of them. For PM candidates, two interviews are typically product design focused and will dive into the three of the product-oriented principles: Think Big, Invent and Simplify and Dive Deep. Another interview will likely be focused on testing Amazon's most famous principle: Customer Obsession. And a fourth interview will be focused on testing how a candidate collaborates with others, digging into principles like Disagree and Commit and Earn Trust. Finally, the last interview will likely dig into one of the more nuanced principles: Are right, A Lot. You can expect the "bar raiser" to dig into this topic. In these interviews, the interviewer will likely dig deep on how a candidate would actually design and build a product at Amazon. The initial prompt might be "What's an area of Amazon that you don't think is doing well and how could we improve it?" or something similarly open-ended that would give the candidate a product space to investigate. While coming up with grand ideas for what Amazon could build in the future is the fun part, Tiwari notes that candidates often struggle with how to decompose the big vision into steps they'd take to build their suggestions. "It's critical to be able to translate the big vision into tactical components to build. For example, if I give you a few developers and resources, what are the tactical items you'd begin building? What key assumptions would you test up front? A lot of candidates fail here - they can't work backwards from the big vision to the tactical details." Another key topic Amazon interviewers want to understand is how the candidate will collaborate with his/her teammates and managers - from developers to designers to managers and executives. Tiwari noted that both are critical for building successful product teams, especially since a relationship built on trust makes it easier to have disagreements yet still push forward as a unified team. "What we want to know is: can this person build a good relationship with a development manager and earn trust? In addition, can they successfully challenge a counterpart and stand up for their ideas?" Amazon is customer obsessed and they expect their PMs to help drive that obsession. In terms of interview scenarios, an assessment of customer obsession will often kick off with a prompt akin to: "Tell me about a time you went above and beyond for a customer." The goal with a question like this, Tiwari said, is not just to demonstrate extra-human work effort, but rather a deep understanding of customer needs and pain points. "We want to see if they really go deep to understand what the customer wanted. If they just cite an example where they worked all night to do something the customer asked, that doesn't quite cut it. We want to see that they understood the root cause of the customer's issue and then delivered a great solution." Furthemore, it's important to note that customer obsession isn't just a "fuzzy" skill. To Amazon, being able to quantify and measure that customer obsession and how well they're delivering on it is key. Thus, it's critical to identify what metrics you'd look at to help understand if a particular product is delivering an exceptional customer experience and the inputs you control to drive that outcome. "At Amazon, the customer experience metrics are always at the top of the metrics stack. Something like NPS is nice but it's too surface level. For example, on the e-commerce side, we might look at how often we successfully deliver on our delivery promise and the inputs that drive it." Finally, no Amazon interview is complete without participation from a Bar-raiser. Bar-raisers are a group of select Amazon interviewers tasked with maintaining a company-wide quality bar for talent. For PMs, it's expected that one of the five interviews will be with a Bar-raiser who intentionally will have little context on the actual role or specific needs of the hiring manager. Amazon structures it this way to ensure the Bar-raiser is primarily concerned with candidate quality and not any acute team needs or demands (which could be fleeting). One common way bar raisers like to test the first principle is by asking something akin to "Tell me about a time you had to make a decision without data." This question illuminates a candidate's judgment, product intuition and how they default to decision making when they don't have any data in front of them to guide them. As with any interview, understanding the company's ethos, guiding principles and core metrics is critical to success. However, at Amazon, it's more important than ever because the company has created a culture that uses their leadership principles on a day-to-day bases and consistently evaluates candidates against a core set of values. For candidates with upcoming PM interviews, Tiwari has one final piece of advice: review the full list of Amazon Leadership Principles and think critically about strong, robust anecdotes and product ideas you can share that demonstrate how you embody each of them. While the specific principles you are tested on might vary, you can be 100% sure your interview will revolve around them. Finally, while there are 14 principles overall, you thankfully don't need 14 different anecdotes! Many anecdotes can illustrate multiple principles at the same time and can be reused. It's significantly better to have a handful of solid anecdotes that provide real color and depth on your thinking, than a whole array of superficial ones.